Over the centuries there have been many theories and rumors regarding King Edward IV being the illegitimate son of an archer named, Blaybourne. The claim was that Edward was not the son of Richard, Duke of York – that Cecily Neville had a brief affair while her husband was on a campaign in Pontoise, France. The rumor was started by Richard Neville, 16th Earl of Warwick. Warwick, also known as the Kingmaker, was the man behind the throne. He assisted Edward IV in victory to claim the throne of England from Henry VI. Warwick had connections and money and felt that Edward would not have become King of England without his help. Warwick craved power and money. However, when Edward IV married Elizabeth Woodville in secret and not the bride that Warwick had suggested he became enraged. Warwick would stop at nothing to get his way. Had Edward married the bribe of Warwick’s choosing than Warwick would have gained more power because of the political alliance he had arranged. So, in order for Warwick to reclaim his power he started the rumor and attempted to place Edward’s brother George, Duke of Clarence on the throne. Warwick believed that if Clarence was on the throne he could better control him and keep more power for himself. He was, after all, called the Kingmaker. There is a documentary called Britain’s Real Monarch that was presented by Tony Robinson – originally aired on 3 January 2004 – I found it on YouTube. The title and theory are laughable. There were many illegitimate children during the history of England and Britain – to point directly to Edward IV and say he is the one that started this awful chain is absurd. So we’ll ignore the audacity of the documentary and look at the facts. Before we go into whether or not it’s possible that Edward was illegitimate, let’s go back to Richard, Duke of York and what let him to be away from his wife in the summer of 1440. Richard Plantagenet was born 21 September 1411 – the son of, Richard, 4th Earl of Cambridge and Anne Mortimer. His father was the son of Edmund of Langley, who was the 1st Duke of York and fourth son of King Edward III. His mother, Anne Mortimer was the great-granddaughter of King Edward III’s second son, Lionel, Duke of Clarence. Shortly after giving birth to Richard, Anne passed away. Only a few years later on 5 August 1415, Richard’s father (Cambridge) was executed for plotting to overthrow King Henry V. Young Richard, barely four years old, became a royal ward. Luckily, Richard was not punished for the actions of his father. 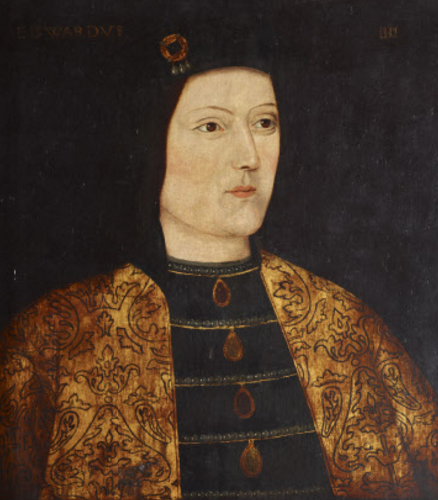 He was allowed to inherit his father’s estates and later receive the title of Duke of York upon the death of his uncle, Edward (2nd Duke of York) at Agincourt on 25 October 1415. On 19 January 1425, Richard inherited another title when his maternal uncle Edmund Mortimer, 5th Earl of March passed away. These titles combined with his own family estates made Richard one of the wealthiest and most powerful nobles in England, second only to the king. On 19 May 1426, Richard was knighted at Leicester by John of Lancaster, 1st Duke of Bedford who was the younger brother of Henry V.
On 6 November 1429 he was present at Westminster Abbey for the coronation of Henry VI. Richard then traveled to France with Henry and also accompanied the king to his coronation in France at Notre Dame on 16 December 1431. On 12 March 1432, he was granted his inheritance and allowed to take full control of his inherited estates. Still in France, May 1536, not long after the death of the Duke of Bedford, Richard was made Lieutenant in France. In 1436, Richard was made Regent of France – he advanced with an army almost to the gates of Paris. In November 1439 Richard returned to England. It was while Richard was in Pontoise, France that the supposed affair between Cecily Neville and Blaybourne occurred. In Alison Weir’s book, Elizabeth of York she says he was in Pontoise from 14 July to 21 August 1440. Richard was there to lift the french siege on the city. His wife Cecily was in Rouen – supposedly. One of the points that were made to explain how it was possible for the affair to happen was the distance from Rouen to Pontoise. They said it was impossible for Richard to travel back and forth during the campaign to see his wife at such a great distance. The distance seems to have been exaggerated. It was said to be 100 miles. 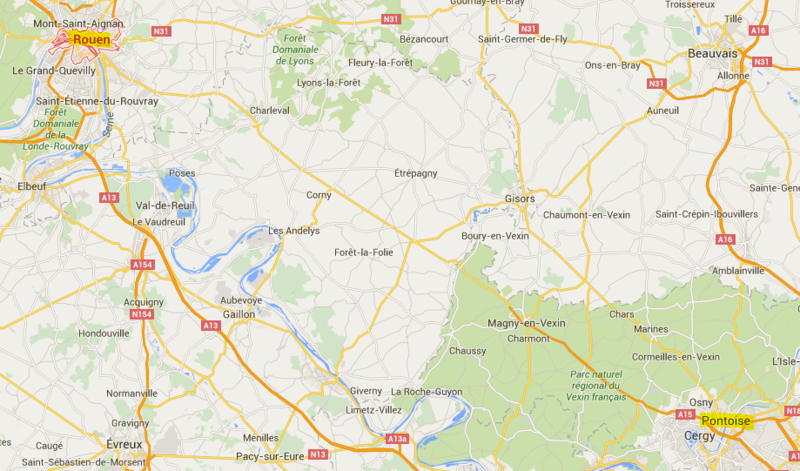 The exact distance between Rouen and Pontoise, France by Google Maps (in 2016) is 92.7 kilometers, or 57.6 miles. It definitely would have been possible for him to travel that far in little time. But, we’re not even sure that he would have done that. This was just a way to deliver the facts and prove that he could gone back to Rouen to be with wife if he had wanted to. Cecily and Richard had a very strong relationship, and it’s been said that she traveled everywhere with him. We can also ask: Did Cecily go to Pointoise along with her husband, or did she stay at Rouen? That question I do not have an answer for – so we’ll assume she stayed back in Rouen, where it was more safe for her to be. Another point that is constantly brought up is that Edward’s birthdate proves that Richard was not able to be the father because he was in Pontoise at the time of Edward’s conception. If he was conceived immediately after Richard returned from Pontoise it is completely possible for him to Edward’s father. If Edward was indeed conceived in late August 1440 and born 28 April 1441 he would indeed have been premature, but only by a few weeks. The fact that he was premature would explain his understated baptism. Many have speculated that since Edward’s younger brother Edmund had a grand baptism and Edward did not that it proves the illegitimacy of Edward. This couldn’t be further from the truth. The reason behind a small affair could also be that the child was premature and weak – that they feared they would lose him so they rushed to a more quaint and private baptism. It was important for a child to be baptized before it died. So the claim that it was impossible for a premature child to survive is also untrue. Edward may have only been a few weeks early – while that would still be dangerous during the mid-15th century it would be survivable. From our research we can conclude that we strongly believe that Edward Plantagenet (Edward IV) was indeed the son of Richard, Duke of York. The research in this article bears out the conclusion. 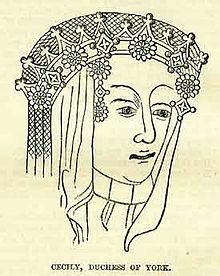 Was Cecily Neville aka , “the Rose of Raby”, ? What `proof` is there that Warwick instigated the rumours that Edward was illegitimate? Isn`t it more correct to say that the allegations of illegitimacy originated from the court of Louis XI of France? And aren`t there some contemporary reports that say that Cicely, upon learning of Edward`s marriage to Elizabeth Woodville herself declared that Edward was not the son of Richard Duke of York? Weren`t there were further reports at the time of Richard III`s usurpation of the throne, that his supporters were circulating the story of Edward`s illegitimacy, with Richard`s approval? I’m looking for my source on the statement. I read that somewhere else I would not have come to that conclusion on my own. Stay tuned. The writer of this article appears to have a problem with dates and years. Edward IV was born on 28th April 1442, not 1441. As far as I am concerned the legitimacy of Edward IV’s heirs is under a cloud because of his secret “marriage” to Elizabeth Woodville.